See all German Pinscher characteristics below! The German Pinscher has the energy and drive of all working breeds, but he's also an outstanding companion. He loves being with his family and will meld himself into every facet of your life. The German Pinscher's playfulness will continue well into adulthood, and he may continue to disembowel squeaky toys long past teething (dental floss is the best repair tool). When German Pinchers are in a spot of trouble at home, some will look you right in the eye and smile, showing their teeth in a big grin. The German Pinscher was originally developed as a working dog who hunted and killed vermin (that means he'll still nail them today, so he's not going to be good in a home with pet rodents). Today, he still has the energy of a working breed and has proved himself to be an all-around kind of guy when it comes to canine sports and careers. 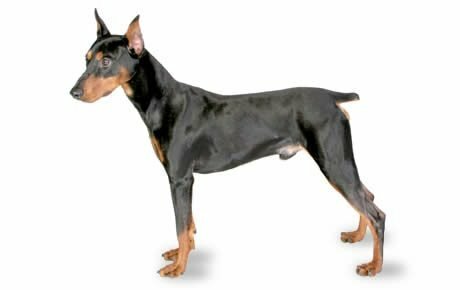 You can find German Pinschers in the conformation ring, at obedience rallies or agility trials, and at work in tracking. He also works as a service dog, therapy dog, and as a pampered pet who enjoys the comforts of family life. He can be assertive and overbearing, and he'll take over your heart and home in a matter of seconds. Don't kid yourself: he needs a firm, experienced owner who is consistent in training and good at establishing rules right from the beginning. If you tend to wimp out or you want a placid dog, find another breed — this one will walk all over you. However, he will also be completely, utterly, and permanently devoted to you. This devotion supports his ability to be an excellent guard dog. Despite an independent streak, he likes to be in the middle of all family activities, right there with you. The German Pinscher will alert bark with a strong voice. If any intruder risks entering your home, this dog will defend it with everything he's got. And he's quite capable of taking care of an intruder: While he's not the largest guard dog around, maxing out at about 45 pounds, he's incredibly skillful at the job. Given that he looks like a small Doberman Pinscher or a humongous Miniature Pinscher (he was a foundation dog for both of those breeds), and that he's suspicious of strangers, he can make some people nervous. He will accept your friends without problems; it's the folks you don't know who might hear that strong voice he's famous for, the one that sounds like it's coming from a much bigger dog. He saves that voice for special occasions. A German Pinscher is intelligent and quick to learn, and he can reach all levels of training and competition. He also has a personality that will test limits (both his own and yours). Apartments make adequate homes if you properly exercise your German Pinscher, but it isn't his ideal situation. He does better with a yard to run in--a properly fenced yard, to prevent any escape-artist tendencies. He has a strong prey drive and will chase any animal deemed interesting (unfortunately, you are not the one doing the deeming). He must be trained — start him at a young age. Since he's so intelligent, the task isn't difficult, even though he isn't as eager to please you as are some breeds; he really needs a firm and consistent owner. Use positive reinforcement and establish consistent rules, because German Pinschers are known for their strong temperament — given half a chance, he'll take control of the house. But if you take the time and effort, the end result of training the German Pinscher is worth all the time it takes. For one thing, you don't want to end up living with a strong, wary, protective dog who's out of control; for another, it's highly satisfying to train such a smart and capable canine. Socialization is just as important as obedience training for the German Pinscher, and it helps avoid aggressiveness. As a puppy he should be socialized to other dogs, puppies, adults, and children. Most obedience schools offer socialization classes, and he can also run errands with you, take long walks, go to the dog park, and have playdates with canine friends and two-legged children. Although a German Pinscher is a loving family companion, he's not recommended for homes with children under the age of nine because of his strong and assertive nature. This can be overpowering even to some adults, but especially to a child. However, if he's the dog for you, then there's no denying that the happy, loving, intelligent German Pinscher will make your family, life, and home complete. The German Pinscher is not recommended for homes with children under the age of nine. A working breed, he needs daily exercise and cannot be left untrained or unexercised. Expect a healthy amount of exercise each day to curb negative behaviors. The German Pinscher can fare all right in an apartment as long as he's walked at least twice a day. However, he's better suited to a home that has a fenced yard. He has a strong prey drive and will chase anything that he deems worth chasing. He should be kept on lead while not in a secured area, and fences should be secure enough that he can't slip through them. The German Pinscher is a strong-willed breed that needs a consistent and firm owner. He has been known to take over a home if rules are not set when he's young. With training and consistency, however, the German Pinscher will learn quickly and well. Naturally suspicious of strangers, the German Pinschers makes an excellent guard dog. By the same token, he needs to be socialized from a young age to prevent the development of aggressive behavior. The German Pinscher enjoys jumping up to greet loved ones, but proper training can correct this trait. He will alert bark and he has a strong, loud voice, but he won't bark unnecessarily. He thrives when he's part of a family and can participate in family activities. He isn't a breed who can live outside, and he's unhappy being forgotten while life is busy. The German Pinscher can become destructive when he's bored. He's also known for his ability to gut toys at an alarming rate. Originally developed to eradicate vermin, the German Pinscher originated in Germany somewhere between the late 1700s and late 1800s. There is no clear evidence of when he was developed, but a painting that dates from about 1780 portrays a dog similar in appearance to the German Pinscher. He was a foundation dog for many breeds, including the Doberman Pinscher and the Miniature Pinscher. The breed was founded by the Rat Pinscher, also known as the Rat Catcher or the Great Ratter, a breed that became extinct in the early 1800s. The German Pinscher was recognized as a breed in 1895. During the World Wars, the German Pinscher came close to extinction. Two breed colors did in fact die out: the pure black and the salt-and-pepper. After World War II, a West German named Werner Jung began breeding German Pinschers and saved the breed. German Pinschers were first imported into the United States in the late 1970s. The German Pinscher is a squarely built, muscular, medium-sized dog. The average height is between 17 to 20 inches for both males and females. They usually weigh between 25 and 45 pounds. The German Pinscher is strong-willed, devoted, and in need of a consistent and firm owner. He can take over a home if rules are not set when he's young. With training and consistency, German Pinschers will learn quickly. Naturally suspicious of strangers, he is an excellent guard dog. Like every dog, the German Pinscher needs early socialization — exposure to many different people, sights, sounds, and experiences — when they're young. Socialization helps ensure that your German Pinscher puppy grows up to be a well-rounded dog. He's like a mischievous kid who will test your boundaries. Sure, he'll housetrain quickly, and he's quite trainable in other respects as well, but he wants to know what he can get away with. You need mental and physical strength to control a German Pinscher and gain his respect. He must have a strong leader whose authority is tempered with patience and respect. If you aren't a calm person or are unable to say no and truly mean it, or you're not really interested in taking on in-depth training, look elsewhere. German Pinschers are generally healthy, but like all breeds, they're prone to certain health conditions. Not all German Pinschers will get any or all of these diseases, but it's important to be aware of them if you're considering this breed. In German Pinschers, you should expect to see health clearances from the Orthopedic Foundation for Animals (OFA) for hip dysplasia (with a score of fair or better), elbow dysplasia, hypothyroidism, and von Willebrand's disease; from Auburn University for thrombopathia; and from the Canine Eye Registry Foundation (CERF) certifying that eyes are normal. You can confirm health clearances by checking the OFA web site (offa.org). Hip Dysplasia: This is an inherited condition in which the thighbone doesn't fit snugly into the hip joint. 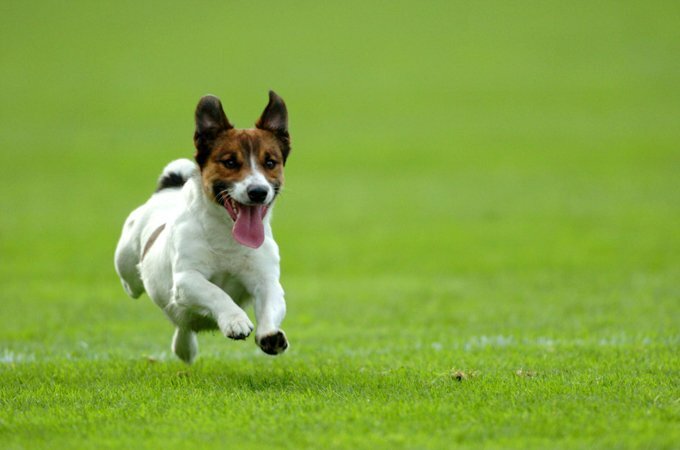 Some dogs show pain and lameness on one or both rear legs, but others don't display outward signs of discomfort. (X-ray screening is the most certain way to diagnose the problem.) Either way, arthritis can develop as the dog ages. Dogs with hip dysplasia should not be bred--so if you're buying a puppy, ask the breeder for proof that the parents have been tested for hip dysplasia and are free of problems. German Pinschers are active and need daily exercise either through a good run in the backyard or two long walks on lead. Supervise your German Pinscher when exercising, since he'll go bounding off after anything that's worth chasing. He'll be all right in an apartment if given enough exercise, but he prefers a home with a fenced yard in which he can play. He isn't suited to living outdoors full-time in a kennel or dog run, however; he thrives being with his family. He's a working breed and enjoys having a job to do. An unstimulated, untrained, and unexercised German Pinscher can head down a scary path of boredom and destruction. Give him something to work on while you're gone, such as interactive toys or Kongs with frozen peanut butter. He's no couch potato, content to lounge about all day enjoying bonbons. Crate training benefits every dog and is a kind way to ensure that your German Pinscher doesn't have accidents in the house or get into things he shouldn't. Like many other dogs, a German Pinscher can be destructive as a pup, and when even when he enters adulthood. Crate training is for his own safety. A crate is also a place where he can retreat for a nap. Crate training at a young age will help your Pinscher accept confinement if he ever needs to be boarded or hospitalized. Never stick your Pinscher in a crate all day long, however. It's not a jail, and he shouldn't spend more than a few hours at a time in it except when he's sleeping at night. He isn't meant to spend his life locked up in a crate or kennel. Exercise, training, and laying down house rules for your German Pinscher all will help ensure that your companion is well behaved. It alleviates stress for you and him and provides opportunities to bond. Keep your German Pinscher in good shape by measuring his food and feeding him twice a day rather than leaving food out all the time. If you're unsure whether he's overweight, give him the eye test and the hands-on test. For more on feeding your German Pinscher, see our guidelines for buying the right food, feeding your puppy, and feeding your adult dog. The coat should be shiny and smooth in texture, short and dense with no bald spots. The German Pinscher sports a variety of colors, including various shades of red, stag red (in which there are black hairs intermingled with the red), and Isabella (a light bay or fawn color). German Pinschers can also be black or blue with tan or red markings. The German Pinscher is an average shedder and requires minimal grooming. Brushing his coat with a cloth or rubber mitt about once a week will get rid of any excess hair. Brush your German Pinscher's teeth at least two or three times a week to remove tartar buildup and the bacteria that lurk inside it. Daily brushing is even better if you want to prevent gum disease and bad breath. Begin accustoming your German Pinscher to being brushed and examined when he's a puppy. Handle his paws frequently — dogs are touchy about their feet — and look inside his mouth. Make grooming a positive experience filled with praise and rewards, and you'll lay the groundwork for easy veterinary exams and other handling when he's an adult. The German Pinscher usually does well with children if he's brought up with them from puppyhood. But because of his assertive nature, he does best with older children, preferably those over the age of nine. An older Pinscher who's unfamiliar with children will probably do best in a home with kids who are mature enough to interact with him properly. Always teach children how to approach and touch dogs, and always supervise any interactions between dogs and young children. Teach your child never to approach any dog while he's eating or to try to take the dog's food away. No dog should be left unsupervised with a child. The same holds true for the German Pinscher's attitude toward some kinds of pets; he does best if he's been raised with them, or at least socialized to them when he's still young. But remember that he was developed to hunt and kill vermin. He's got a high prey drive that's hardwired, and no amount of training will keep him from going after a pet rat. He's not a good match with small mammals. German Pinschers are often purchased without any clear understanding of what goes into owning one. There are many German Pinschers in need of adoption and or fostering. There are a number of rescues that we have not listed. If you don't see a rescue listed for your area, contact the national breed club or a local breed club and they can point you toward a German Pinscher rescue. Below are breed clubs, organizations, and associations where you can find additional information about the German Pinscher.